In business for over 35 years, we are one of the most trusted drapery design services in Southwestern Pennsylvania. Trust the professionals at Audrey’s Custom Draperies to turn ordinary windows into extraordinary windows. 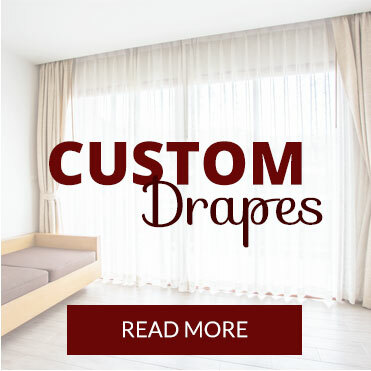 You will see the difference our custom draperies add to every room of your home or office. You can order our custom blinds and shutters painted or stained. Quality window treatments from Audrey’s Custom Draperies give your room the complete and tailored look you desire without the hassle. We carry top-quality brands like Levolor, Graber, and Kirsch to keep your windows looking great for years. We design custom bedding to meet your needs. Count on Audrey’s to create custom bedding that can blend into your décor or make an impressive accent. Rely on us for custom upholstered headboards, pillows, comforters, duvets, dust ruffles, and more! Debbie, our designer at Audrey’s Custom Draperies, works hard to bring quality service and beautiful products to your home. We offer free, in-home consultations, so you can leave it to us to get the perfect measurements of your windows. Once our designer creates your custom window treatments, our professional installer will come to your home and hang them for you at no extra cost. Be assured that our owner and designer, Debbie, is ALWAYS on the job site. Call us today for a free, in-home consultation or to make an appointment to meet with Debbie at (724) 483-8045.
roller & solar fabric shades.